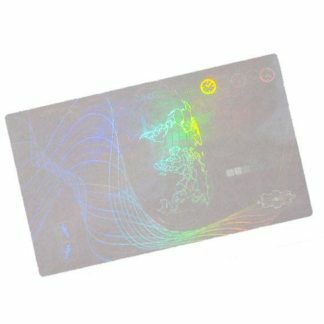 Holograms for cards and brand protection. Factor in additional approximately R20,000 for customization cost if you want your own design. If you are considering using holographic labels and foils to protect your brand from counterfeiting or just want to freshen up your product appeal please let us show you how beautiful and affordable your own personalized hologram can be in a dazzling array of colours, shapes and styles. Customized high security hologram labels in many sizes, shapes, styles and colours to suit the product and brand. These labels can be supplied in sheets or rolls to be applied manually or with an automatic labeling machine. Due to the nature of a sophisticated hologram manufacture process, the holograms provide a significant barrier to fraudulent duplication or counterfeiting of products. Often the damage to a brand value by counterfeit products is greater than the financial loss of the counterfeit products themselves. Protect your brand by using holograms which can include many security features including laser etched serial numbers which can be effective tools for track and trace applications of cheap products where RFID is too expensive a solution to implement. Holograms do not require sophisticated reading hardware and can be verified easily in the field. The Tamper evident nature of the self destructing layers of holographic image mean that it is near impossible to use an existing hologram for another application. Holograms are also an effective marketing tool for drawing attention to a product. It’s hard to deny the brilliance of the multi-coloured and well designed label when placed on a card, box, certificate, invoice or envelope. Your own design. This is a once off charge per order and is all inclusive of all security features inherent in the holographic labels.